Cost to powder coat varies greatly by region (and even by zip code). Get free estimates from painters in your city. Cost to powder coat varies greatly by region (and even by zip code). The average cost of powder coating is around $250. How much does it cost to powder coat? Powder coating applies a tough, durable, uniform finish to many everyday objects. Handrails 1, bed frames, patio furniture, and fences are all frequently powder coated rather than simply painted to give them a longer-lasting finish. The cost of powder coating depends largely on the item you have finished and its size. For the average homeowner looking to powder coat a bed frame, the cost is around $250. Like any material or finish, powder coating has both positive and negative attributes. This finish is very tough and durable, and you can get a thicker coating more evenly and quickly than you can with liquid paint. It is also better for the environment because there are no volatile organic chemicals (VOCs) emitted during the application process. There are no solvents involved and little waste because the oversprayed powder can be reclaimed and used again. However, it is difficult to get a very thin coat of material onto a surface with powder coat like you can with paint. It also takes longer to cure for thick coats and large objects and requires special equipment, such as an oven for curing. So, the start-up costs and initial investment are higher than with liquid paint. While most people associate powder coating with metallic surfaces, it can actually be used on a fairly wide range of materials including plastic, medium-density fiberboard (MDF), and metals like aluminum and wrought iron. It is rare to apply this material to wood, although it is possible. With the exception of wrought iron, the material you are applying the finish to will not impact the project cost. Wrought iron costs more to powder coat because the process takes longer to cure. The specific gravity or weight of the powder equal to its transfer coverage has some impact on the project. The higher the powder-specific gravity, the more coverage it can give an item. In addition, the higher the specific gravity, the thicker a coat can be. If you desire a thicker coat of color on your furniture or handrail 1, then the specific gravity of the powder needs to be higher, which may raise the cost of the project. Ideally, no waste should exist when applying the powder to the surface it will cover. When this occurs, it is known as 100% transfer efficiency. A lower percentage means more powder fell away from the surface. In most cases, this leftover powder can be reclaimed and used again, so there is no waste with overspray like there is with liquid paint. However, the lower the transfer efficiency, the higher the specific gravity needs to be to give you the same amount of coverage or thickness in the finished coat. Powder coating is a relatively simple procedure that uses a powder of polymer resins mixed with pigments, curatives, and flow modifiers. The powder is made when these materials are mixed and ground down together until the resulting mixture looks like baking flour. The powder is applied to the surface through an electrostatic spray deposition system. This system charges the powder particles, which makes them attracted to the grounded surface - the item you are spraying. The powder is sprayed onto the surface, then heat-cured to bond the powder in place. This is done when heat causes the polymers to form long chains that crosslink with one another. The finished product is very smooth, durable, and long-lasting. In some cases, the surface must first be sandblasted to get rid of previous coverings to give the new finish the best, smoothest appearance. 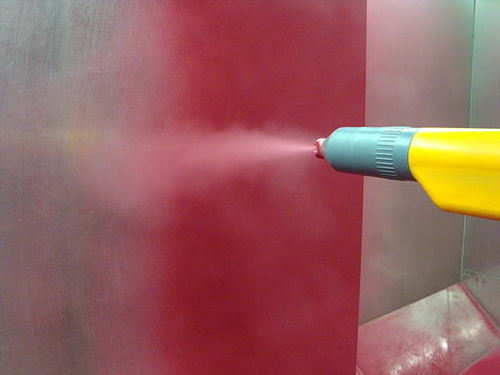 In other instances, the first coating - particularly metallic coatings - must be given a clear coat of another powder coat to ensure the best and longest lasting results. The entire process takes a few hours from start to finish generally, although very large items have a longer curing time. Most powder coating companies charge around $50 per hour in labor fees in addition to the cost to powder coat an item. For this reason, minimum fees are usually associated with the project. So even though powder coating a lawn ornament may cost only $25, between labor fees and minimums, the cost will likely be closer to $100. If it needs sandblasting first, the price rise to around $150. For this reason, many people choose to have multiple items powder coated at once, such as an entire patio set, rather than a single table. Depending on the item you choose to finish, you may want to consider painting the material instead. While powder coating is much more durable and can produce a thicker finish with less time than wet painting, it does rely on heat to complete the job. Some materials, such as low-temperature plastics or some types of wood, cannot handle that heat, so wet painting must be used instead. Wet painting may result in a more uneven finish when trying to produce a thicker coat but can give a much more even, thin coat than powder coating. Ultimately, labor costs are roughly the same for both procedures, and unless you are using an item that cannot handle heat or needs a much thinner coat, powder coating will last longer with better results. Powder coating can be done with one of two materials - thermoset and thermoplastic. From a durability standpoint, there is little difference between the two. It is mostly in how the finished product is formed. Thermoplastics melt with heat to produce their cross-linked chains. They can remelt and reform again and again when exposed to the same degree of heat. Thermoset plastics do not remelt. They use a chemical process to change the polymers when heat is applied. So, they are permanent once done. Some colors and finishes may require one process over the other for the best results. In terms of costs and how well it will perform for you, there is no difference. If your surface already has a finish, it must be removed before powder coating can begin. In this case, the old finish is generally sandblasted off. The cost of this ranges from $25 to $300 per piece, with most companies having a minimum charge of $75 for sandblasting. Plating or electrostatic wet painting can be an alternative if you want a metal finish on your piece, such as gold. A powder coat will last longer, but the plating may give you a better finish in the meantime. Most powder coats are done in black as the standard finish, but many other colors and finishes are available including bright colors, metallics, and even glitter. Powder coat is not recommended as a DIY project due to the amount of equipment necessary. A clear coat is sometimes applied to the finished product, but this must be done over a dry surface and adds an extra 50% to the finished costs. Non-standard colors and metallics cost more than standard finishes, sometimes by 25% to 50% more. Although, some companies only charge a small, nominal fee. The surface of the item to be powder coated must be clean and dry as well as free of any previous finish before applying the new one. Is powder coating cheaper than painting? The cost of powder coating an item is generally comparable to the cost of wet painting it. Can you powder coat over existing paint? How long does powder coating take to cure? Powder coating is heat cured and may take anywhere from hours to days depending on the thickness of the coat and the size of the area. When should you apply the clear coat? The clear coat can be applied once the powder coat has cured. How much does it cost to powder coat in my city? Cost to powder coat varies greatly by region (and even by zip code). To get free estimates from local contractors, please indicate yours.